A strange between-time of the year that has many traditions. We always lit a candle in the window and blew it put out after midnight, blowing away the past and welcoming in the new. Once the midnight count-down ends it was time to go out with horns, bugles, saucepan lids and other noise making instruments, ringing out the past and ringing in the new and keeping bad luck from entering the house. Growing up I remember all the ships at the docks would sound their horns and there would be red Very Lights (flares) let off at the docks. They would float in the sky falling slowly with their smoke trails behind. One windy year one got blown our way and landed in the garden and nearly set the hedge on fire. I always thought the adults were saying fairy lights when they said Very Lights so I thought fairies set off the red lights in the sky. A few years there were fireworks and the noise would certainly chase the spirits away. There used to be a time when the neighbours here would all be out and we’d be singing Auld Lang Syne and dancing in the street. Nowadays, people seem to keep to themselves which is another tradition gone. Once the noise making is done it is time to open all the doors and windows to let the old year out and welcome the new year in. 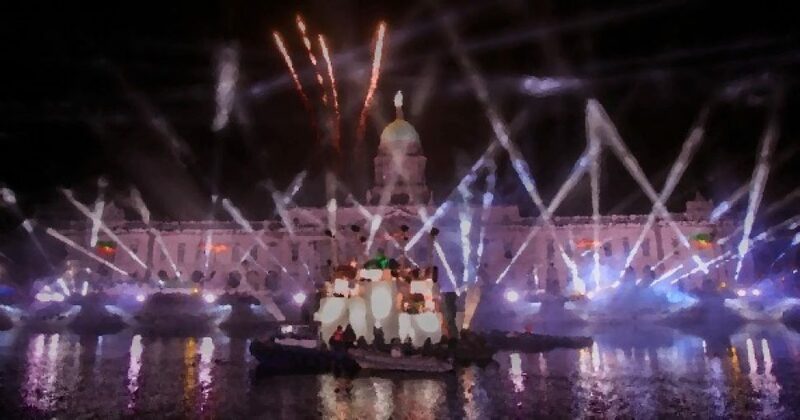 Dublin's Customs House and Quays celebrations. Then there is the tradition of ‘first footer’. A dark haired man was to be the first stranger across the door to bring good luck to the household for the year. I’ve heard it said that if it was a red head, bad luck would follow. We’ve always been blessed with a dark haired man as a first footer. Next day. New Years Day, had some traditions also. You should not sweep on New Year's Day, or you will sweep your good luck away. Nor should you take anything out of the house, not even trash. It was considered unlucky to throw out the ashes from the previous fire, or the sweepings of the floor. The ashes and sweepings were disposed of before midnight on the eve, as not doing so would result in a year of bad luck. If you must carry something out, be sure to bring something else in FIRST. I ‘ve come across a tradition from Spain where you eat 12 grapes at midnight, one on each chime they represent the twelve months of the year. Some may be sweet, some may be sour and correspond to that month of the year. Tried that one year but forgot to write down which were to be the sweet months and which the sour so I can’t vouch for it. It’s always interesting to hear other peoples traditions. However you may celebrate, have a lovely evening and may the coming year bring lots of good health, joy and laughter and happiness.